The ancient Greeks were a deeply religious people. They worshipped many gods whom they believed appeared in human form and yet were endowed with superhuman strength and ageless beauty. The Iliad and the Odyssey, our earliest surviving examples of Greek literature, record men's interactions with various gods and goddesses whose characters and appearances underwent little change in the centuries that followed. While many sanctuaries honored more than a single god, usually one deity such as Zeus at Olympia or a closely linked pair of deities like Demeter and her daughter Persephone at Eleusis dominated the cult place. Elsewhere in the arts, various painted scenes on vases, and stone, terracotta and bronze sculptures portray the major gods and goddesses. The deities were depicted either by themselves or in traditional mythological situations in which they interact with humans and a broad range of minor deities, demi-gods and legendary characters. The ancient Greeks did not generally leave elaborate grave goods, except for a coin in the hand to pay Charon, the ferryman to Hades, and pottery; however the epitaphios or funeral oration (from which epitaph comes) was regarded as of great importance, and animal sacrifices were made. Those who could afford them erected stone monuments, which was one of the functions of kouros statues in the Archaic period before about 500 BCE. These were not intended as portraits, but during the Hellenistic period realistic portraiture of the deceased were introduced and family groups were often depicted in bas-relief on monuments, usually surrounded by an architectural frame. The walls of tomb chambers were often painted in fresco, although few examples have survived in as good condition as the Tomb of the Diver from southern Italy. Almost the only surviving painted portraits in the classical Greek tradition are found in Egypt rather than Greece. The Fayum mummy portraits, from the very end of the classical period, were portrait faces, in a Graeco-Roman style, attached to mummies. Early Greek burials were frequently marked above ground by a large piece of pottery, and remains were also buried in urns. Pottery continued to be used extensively inside tombs and graves throughout the classical period. The larnax is a small coffin or ash-chest, usually of decorated terracotta. The two-handled loutrophoros was primarily associated with weddings, as it was used to carry water for the nuptial bath. However, it was also placed in the tombs of the unmarried, "presumably to make up in some way for what they had missed in life." The one-handled lekythos had many household uses, but outside the household its principal use was for decoration of tombs. Scenes of a descent to the underworld of Hades were often painted on these, with the dead depicted beside Hermes, Charon or both - though usually only with Charon. Small pottery figurines are often found, though it is hard to decide if these were made especially for placing in tombs; in the case of the Hellenistic Tanagra figurines this seems probably not the case. But silverware is more often found around the fringes of the Greek world, as in the royal Macedonian tombs of Vergina, or in the neighbouring cultures like those of Thrace or the Scythians. Men ran the government, and spent a great deal of their time away from home. When not involved in politics, the men spent time in the fields, overseeing or working the crops, sailing, hunting, in manufacturing or in trade. For fun, in addition to drinking parties, the men enjoyed wrestling, horseback riding, and the famous Olympic Games. When the men entertained their male friends, at the popular drinking parties, their wives and daughters were not allowed to attend. With the exception of ancient Sparta, Greek women had very limited freedom outside the home. They could attend weddings, funerals, some religious festivals, and could visit female neighbors for brief periods of time. In their home, Greek women were in charge. Their job was to run the house and to bear children. Most Greek women did not do housework themselves. Most Greek households had slaves. Female slaves cooked, cleaned, and worked in the fields. Male slaves watched the door, to make sure no one came in when the man of the house was away, except for female neighbors, and acted as tutors to the young male children. Wives and daughters were not allowed to watch the Olympic Games as the participants in the games did not wear clothes. Chariot racing was the only game women could win, and only then if they owned the horse. If that horse won, they received the prize. The ancient Greeks considered their children to be 'youths' until they reached the age of 30! When a child was born to ancient Greek family, a naked father carried his child, in a ritual dance, around the household. Friends and relatives sent gifts. The family decorated the doorway of their home with a wreath of olives (for a boy) or a wreath of wool (for a girl). In Athens, as in most Greek city-states, with the exception of Sparta, girls stayed at home until they were married. Like their mother, they could attend certain festivals, funerals, and visit neighbors for brief periods of time. Their job was to help their mother, and to help in the fields, if necessary. The goal of education in the Greek city-states was to prepare the child for adult activities as a citizen. The nature of the city-states varied greatly, and this was also true of the education they considered appropriate. In most Greek city-states, when young, the boys stayed at home, helping in the fields, sailing, and fishing. At age 6 or 7, they went to school. Both daily life and education were very different in Sparta [militant], than in Athens [arts and culture] or in the other ancient Greek city-states. The goal of education in Sparta, an authoritarian, military city-state, was to produce soldier-citizens who were well-drilled, well-disciplined marching army. Spartans believed in a life of discipline, self-denial, and simplicity. Boys were very loyal to the state of Sparta. The boys of Sparta were obliged to leave home at the age of 7 to join sternly disciplined groups under the supervision of a hierarchy of officers. From age 7 to 18, they underwent an increasingly severe course of training. Spartan boys were sent to military school at age 6 or 7. They lived, trained and slept in their the barracks of their brotherhood. At school, they were taught survival skills and other skills necessary to be a great soldier. School courses were very hard and often painful. Although students were taught to read and write, those skills were not very important to the ancient Spartans. Only warfare mattered. The boys were not fed well, and were told that it was fine to steal food as long as they did not get caught stealing. If they were caught, they were beaten. They walked barefoot, slept on hard beds, and worked at gymnastics and other physical activities such as running, jumping, javelin and discus throwing, swimming, and hunting. They were subjected to strict discipline and harsh physical punishment; indeed, they were taught to take pride in the amount of pain they could endure. At 18, Spartan boys became military cadets and learned the arts of war. At 20, they joined the state militia--a standing reserve force available for duty in time of emergency--in which they served until they were 60 years old. The typical Spartan may or may not have been able to read. But reading, writing, literature, and the arts were considered unsuitable for the soldier-citizen and were therefore not part of his education. Music and dancing were a part of that education, but only because they served military ends. If they passed, they became a full citizen and a Spartan soldier. Spartan citizens were not allowed to touch money. That was the job of the middle class. Spartan soldiers spent most of their lives with their fellow soldiers. They ate, slept, and continued to train in their brotherhood barracks. Even if they were married, they did not live with their wives and families. They lived in the barracks. Military service did not end until a Spartan male reached the age of 60. At age 60, a Spartan soldier could retire and live in their home with their family. Unlike the other Greek city-states, Sparta provided training for girls that went beyond the domestic arts. The girls were not forced to leave home, but otherwise their training was similar to that of the boys. They too learned to run, jump, throw the javelin and discus, and wrestle mightiest strangle a bull. Girls also went to school at age 6 or 7. They lived, slept and trained in their sisterhood's barracks. No one knows if their school was as cruel or as rugged as the boys school, but the girls were taught wrestling, gymnastics and combat skills. Some historians believe the two schools were very similar, and that an attempt was made to train the girls as thoroughly as they trained the boys. In any case, the Spartans believed that strong young women would produce strong babies. In most of the other Greek city-states, women were required to stay inside their homes most of their lives. In Sparta, citizen women were free to move around, and enjoyed a great deal of freedom, as their husbands did not live at home. The goal of education in Athens, a democratic city-state, was to produce citizens trained in the arts of both peace and war. In ancient Athens, the purpose of education was to produce citizens trained in the arts, to prepare citizens for both peace and war. Other than requiring two years of military training that began at age 18, the state left parents to educate their sons as they saw fit. The schools were private, but the tuition was low enough so that even the poorest citizens could afford to send their children for at least a few years. Until age 6 or 7, boys generally were taught at home by their mother. Most Athenian girls had a primarily domestic education. The most highly educated women were the hetaerae, or courtesans, who attended special schools where they learned to be interesting companions for the men who could afford to maintain them. Boys attended elementary school from the time they were about age 6 or 7 until they were 13 or 14. Part of their training was gymnastics. Younger boys learned to move gracefully, do calisthenics, and play ball and other games. The older boys learned running, jumping, boxing, wrestling, and discus and javelin throwing. The boys also learned to play the lyre and sing, to count, and to read and write. But it was literature that was at the heart of their schooling. The national epic poems of the Greeks - Homer's Odyssey and Iliad - were a vital part of the life of the Athenian people. As soon as their pupils could write, the teachers dictated passages from Homer for them to take down, memorize, and later act out. Teachers and pupils also discussed the feats of the Greek heroes described by Homer. The education of mind, body, and aesthetic sense was, according to Plato, so that the boys. From age 6 to 14, they went to a neighborhood primary school or to a private school. Books were very expensive and rare, so subjects were read out-loud, and the boys had to memorize everything. To help them learn, they used writing tablets and rulers. At 13 or 14, the formal education of the poorer boys probably ended and was followed by apprenticeship at a trade. The wealthier boys continued their education under the tutelage of philosopher-teachers. Until about 390 BC there were no permanent schools and no formal courses for such higher education. Socrates, for example, wandered around Athens, stopping here or there to hold discussions with the people about all sorts of things pertaining to the conduct of man's life. But gradually, as groups of students attached themselves to one teacher or another, permanent schools were established. It was in such schools that Plato, Socrates, and Aristotle taught. The boys who attended these schools fell into more or less two groups. Those who wanted learning for its own sake studied with philosophers like Plato who taught such subjects as geometry, astronomy, harmonics (the mathematical theory of music), and arithmetic. Those who wanted training for public life studied with philosophers like Socrates who taught primarily oratory and rhetoric. In democratic Athens such training was appropriate and necessary because power rested with the men who had the ability to persuade their fellow senators to act. Birds, dogs, goats, tortoises, and mice were all popular pets. Cats, however, were not. Greek houses, in the 6th and 5th century B.C., were made up of two or three rooms, built around an open air courtyard, built of stone, wood, or clay bricks. Larger homes might also have a kitchen, a room for bathing, a men's dining room, and perhaps a woman's sitting area. Although the Greek women were allowed to leave their homes for only short periods of time, they could enjoy the open air, in the privacy of their courtyard. Much of ancient Greek family life centered around the courtyard. The ancient Greeks loved stories and fables. One favorite family activity was to gather in the courtyard to hear these stories, told by the mother or father. In their courtyard, Greek women might relax, chat, and sew. Most meals were enjoyed in a courtyard near the home. Greek cooking equipment was small and light and could easily be set up there. On bright, sunny days, the women probably sheltered under a covered area of their courtyard, as the ancient Greeks believed a pale complexion was a sign of beauty. Along the coastline, the soil was not very fertile, but the ancient Greeks used systems of irrigation and crop rotation to help solve that problem. They kept goats, for milk and cheese. They sometimes hunted for meat. Now and then, they might buy jewelry from a traveling peddler, hairpins, rings, and earrings, but only the rich could afford much jewelry. Both men and women in ancient Athens, and in most of the other city-states, used perfume, made by boiling flowers and herbs. The first real hat, the broad-brimmed petasos, was invented by the ancient Greeks. It was worn only for traveling. A chin strap held it on, so when it was not needed, as protection from the weather, it could hang down ones back. Both men and women enjoyed using mirrors and hairbrushes. Hair was curled, arranged in interesting and carefully designed styles, and held in place with scented waxes and lotions. Women kept their hair long, in braids, arranged on top of their head, or wore their hair in ponytails. Headbands, made of ribbon or metal, were very popular. Blond hair was rare. Greek admired the blonde look and many tried bleaching their hair. Men cut their hair short and, unless they were soldiers, wore beards. Barber shops first became popular in ancient Greece, and were an important part of the social life of many ancient Greek males. In the barber shop, the men exchanged political and sports news, philosophy, and gossip. Dance was very important to the ancient Greeks. They believed that dance improved both physical and emotional health. Rarely did men and women dance together. Some dances were danced by men and others by women. There were more than 200 ancient Greek dances; comic dances, warlike dances, dances for athletes and for religious worship, plus dances for weddings, funerals, and celebrations. Dance was accompanied by music played on lyres, flutes, and a wide variety of percussion instruments such as tambourines, cymbals and castanets. The ancient Greeks loved stories. They created many marvelous stories, myths, and fables that we enjoy today, like Odysseus and the Terrible Sea and Circe, a beautiful but evil enchantress. Aesop's Fables, written by Aesop, an ancient Greek, are still read and enjoyed all over the world. In ancient Athens, wedding ceremonies started after dark. The veiled bride traveled from her home to the home of the groom while standing in a chariot. Her family followed the chariot on foot, carrying the gifts. Friends of the bride and groom lit the way, carrying torches and playing music to scare away evil spirits. During the wedding ceremony, the bride would eat an apple, or another piece of fruit, to show that food and other basic needs would now come from her husband. Gifts to the new couple might include baskets, furniture, jewelry, mirrors, perfume, vases filled with greenery. In ancient Sparta, the ceremony was very simple. After a tussle, to prove his superior strength, the groom would toss his bride over his shoulder and carried her off. Over centuries, the ancient Athenian cocktail parties went full circle, from a practice reserved for the elite to one open to everyone and then, by the fourth century B.C., back to a luxurious display of consumption most could not afford. Slavery played a major role in ancient Greek civilization. Slaves could be found everywhere. They worked not only as domestic servants, but as factory workers, shopkeepers, mineworkers, farm workers and as ship's crew members. There may have been as many, if not more, slaves than free people in ancient Greece. It is difficult for historians to determine exactly how many slaves there were during these times, because many did not appear any different from the poorer Greek citizens. There were many different ways in which a person could have become a slave in ancient Greece. They might have been born into slavery as the child of a slave. They might have been taken prisoner if their city was attacked in one of the many battles which took place during these times. They might have been exposed as an infant, meaning the parents abandoned their newborn baby upon a hillside or at the gates of the city to die or be claimed by a passerby. This method was not uncommon in ancient Greece. Another possible way in which one might have become a slave was if a family needed money, they might sell one of the children into slavery. Generally it was a daughter because the male children were much needed to help out with the chores or the farm. Kidnapping was another fairly common way in which one could have been sold into slavery. Slaves were treated differently in ancient Greece depending upon what their purpose was. If one was a household servant, they had a fairly good situation, at least as good as slavery could be. They were often treated almost as part of the family. They were even allowed to take part in the family rituals, like the sacrifice. Slaves were always supervised by the woman of the house who was responsible for making sure that all the slaves were kept busy and didn't get out of line. This could be quite a task as most wealthy Greek households had as many as 10-20 slaves. There were limits to what a slave could do. They could not enter the Gymnasium or the Public Assembly. They could not use their own names, but were assigned names by their master. 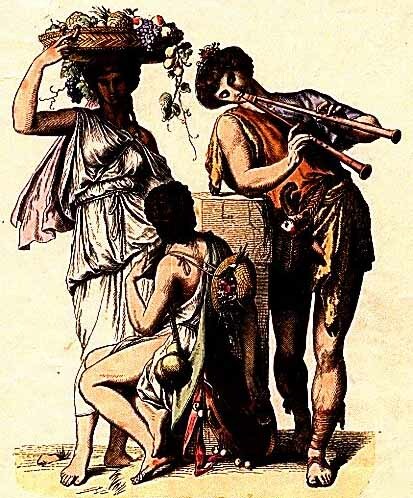 Not all forms of slavery in ancient Greece were as tolerable as that of the domestic servant. The life of a mineworker or ship's crew member was a life of misery and danger. These people usually did not live long because of the grueling work and dangerous conditions of their work. Often those forced into these conditions were those condemned to death for committing crimes because it was understood that they wouldn't live very long under these circumstances. It is surprising to note that the police force in ancient Athens was made up mainly of slaves. Many of the clerks at the treasury office were slaves. Slavery was a very important part of ancient Greece. It played a major role in so many aspects of Greek civilization from domestic living to the infamous Athenian naval fleet. The price one might have paid for a slave in ancient Greek times varied depending on their appearance, age and attitude. Those who were healthy, attractive, young and submissive, could sell for as much as 10 minae ($180.00). Those who were old, weak and stubborn might have sold for as little as 1/2 a mina ($9.00). If there happened to be a large supply of slaves on the market, the price automatically went down. This usually happened after winning a large battle, when there were many prisoners of war. Traditionally, studies of Ancient Greece focus on the political, military and cultural achievements of Greek men. Unfortunately, the information we have about ancient Greek women is biased because it comes from various sources such as plays, philosophical tracts, vase paintings and sculptures which were completed by males. From these sources, we can conclude that Greek society was highly stratified in terms of class, race, and gender. The segregation of male and female roles within ancient Greece was justified by philosophical claims of the natural superiority of males. As we shall learn, slave women were at a disadvantage in Greek society not only because of their gender but also because of their underprivileged status in the social hierarchy. Slave labor was an essential element of the ancient world. While male slaves were assigned to agricultural and industrial work, female slaves were assigned a variety of domestic duties which included shopping, fetching water, cooking, serving food, cleaning, child-care, and wool-working. In wealthy households some of the female servants had more specialized roles to fulfill, such as housekeeper, cook or nurse. Because female slaves were literally owned by their employers, how well slaves were treated depended upon their status in the household and the temperament of their owners. As a result of her vulnerable position within household, a female slave was often subjected to sexual exploitation and physical abuse. Any children born of master-servant liaisons were disposed of because female slaves were prohibited from rearing children. Xenophon's Oceonomicus reveals that slaves were even prohibited from marrying, as marriage was deemed the social privilege of the elite citizens of Athens. In addition to their official chores in the household, slave girls also performed unofficial services. For example, there is evidence that close relationships developed between female slaves and their mistresses. Given the relative seclusion of upper-class women in the private realm of their homes, many sought out confidantes in their slave girls. For example, Euripedes' tragic character of Medea confided her deepest feelings with her nurse, who both advised and comforted her in her troubled times. Furthermore, slaves always accompanied their mistresses on excursions outside of the home. Tombstones of upstanding Athenian women often depict scenes of familiarity between the deceased and her slave companion. It is likely that a sense of their common exclusion from the masculine world of public affairs would have drawn women together, regardless of class. The only public area in which women were allowed to participate was religion. Slave women were included in some religious affairs and could be initiated to the Eleusinian Mysteries which celebrated the myth of Persephone. Thus, the fate of a Greek slave girl was determined by circumstance and more or less rested in the hands of her owners, who had the power to shape her existence.